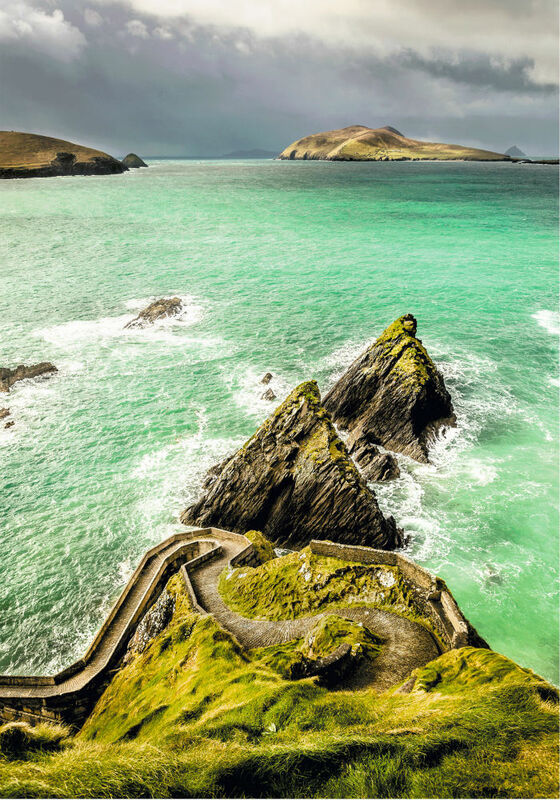 The Dingle peninsula, Co. Kerry has to be one of the most beautiful areas of Ireland. I visit Dingle and Co. Kerry at least once a year. I return there for many reasons but principally it’s for the spectacular beauty of its landscape. In March 2016 I once again headed to Dingle. I arrived at about 5pm and without stopping, I continued on through the town and out to Slea Head. There was still light in the sky and I was determined to make the most of it. The conditions were just as I like it. The weather was disturbed, the sky had all sorts of colours and shapes forming and the sea was likewise unsettled. I got some interesting shots of the Blasket Islands, Coumeenole beach and on my return to Dingle there was an Irish Naval service vessel resting at anchor in the shelter of Dingle Bay. The light was too low at nearly 8pm, so I had something to eat in dingle, a quiet pint or two of Guinness and an early night. I headed to bed full of excitement with the thought of a few days on the Dingle peninsula with my camera chasing the light. Up early the next morning and out on Slea Head by 7.30am. The weather was just as I had left it the night before…..perfect ! I spent some time at each location as I travelled along, taking pictures as I went. When I arrived at Dunquin Pier the light had improved greatly. I never saw Dunquin and the view of The Blasket Islands look so fantastic. Shafts of light broke through cloud cover and illuminated the unsettled sea, resulting in beautiful shades of green, blue and turquoise . This was mirrored by the tones and shades of the blues and greys of the equally unsettled sky. I walked down the very steep path of Dunquin Pier using my tripod as a crutch to steady myself. My senses were on overdrive with the smells, sights and sounds of this natuaral and raw wonderland. After spending some time on Dunquin Pier I began my steep climb back up-top. On my accent I was met by a young American couple. I could clearly see the joy and wonder in their facial expressions as we met. The young lady greeted me with the announcement that this was the “most magnificent place in the world……it was awesome” and indeed it was. She told me that she had travelled extensively and that this was simply the most beautiful place that she had ever been to. She continued on down the path in the stiff cold March breeze totally unconcerned with the now falling rain. This is the magic of Dingle and Co. Kerry. I spent three blissful days on the Dingle peninsula, sometimes cold, sometimes wet, but always happy and excited with the anticipation of coming home with some amazing pictures in the bag.